Hygienic Panel Joining Instructions: Composite Fibreglass Mouldings produce bullet proof fibreglass panels, hygienic tile panels with built in antimicrobial protection and bespoke fibreglass mouldings. Gloves should be worn to protect hands during handling and fitting. Apply the mixed solution to the joint using a small narrow brush. 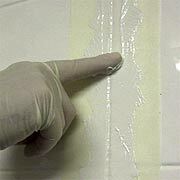 Use a gloved finger to carefully run down the gel to make a grout line. Use a small amount of acetone on a cloth to remove any excess Gelcoat. The acetone can also be used to clean the brushes. Like any tiling system, due consideration has to be taken to ensure the best finish. 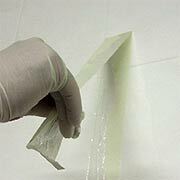 Before attaching the panels to the walls you must ensure the surface is dry, clean and grease free. Surface scoring may be needed in some cases. New plaster will need to be sealed. Trial Fit: careful measurements should be taken to ensure the panels are cut to the correct size prior to mounting. 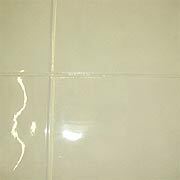 For the best finish, consideration should be given to the tile effect, as the panels need to align such that the grout lines are straight panel to panel. NoTile™ will suit most wall types even where there is some distortion or unevenness and will accommodate existing materials such as brick, plaster, plastics, wood, metals and even over existing tiles. The sheets are supplied flat and must be stored flat at all times. Care must be taken to ensure the high glass surface is not scratched. Approximately 1 tube of adhesive should cover 1m/2. 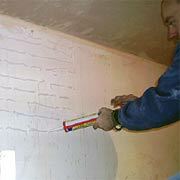 Apply to the walls using a mastic gun in random horizontal and vertical lines. Do not use the 'dot & dab' technique. Ensure all edges are firmly bonded down. Press the panels firmly against the wall to spread the adhesive underneath. You may have to go back a few minutes later and press them down again. Wipe away any excess adhesive with a clean cloth. Leave a gap of approximately 2mm between each panel - this is to represent a grout line and will be filled in with the jointing material at a later stage. A jointing kit will be provided with the panels. Once the panels are in position and aligned correctly, apply the masking tape to each side of the joint to protect the adjoining panels. 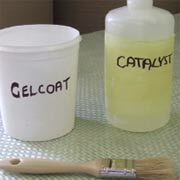 To a small amount of Gelcoat (fill 1/5 of a pot at a time) add the catalyst at a rate of approximately 2% - this may just be a few droplets. Mix thoroughly before application. Apply the mixed solution to the joint using a small narrow brush, ensure the joint is filled smoothly by running a gloved finger along the joint. (You must work reasonably quickly as once the solution starts to go warm or lumpy you must stop using it as it has started to cure). 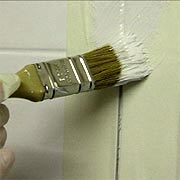 Once the entire joint is filled, remove the masking tape as soon as possible before the mixture cures to a hard finish. This process can be used on vertical, horizontal, external and internal joints. But joints can be made by carefully sanding the edges of the panels to ensure the correct alignment is achieved.